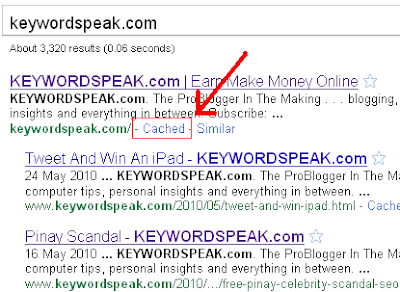 When Was The Last Time Google Indexed My Website Or Blog? Do you know on how often google indexed a website, because I want to know when was the last time google bots had crawled or indexed my blog. Hi, knowing how often google crawled a particular website is a hard question to answer accurately, not even the google people can tell it in absolution. Simply because websites are indefinite in numbers, indefinite I said because an estimated 30 thousands new websites are created everyday. So it's hard to tell when would google can get back to your website to see your updated content. You can though influence this by having quality back link pointing to your website or blog. Rest assured, google's bots crawls the internet web page continously, countinously means no end nor a pause. 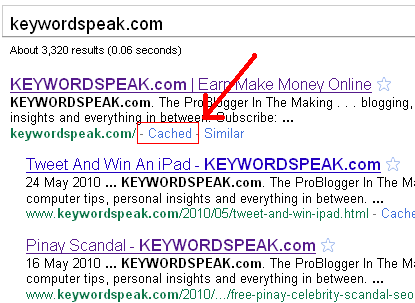 Referring with your other question on you wanting to know when google bot last indexed your blog is a little easy. Just go to google homage and search your domain and see the date when google last save a cache of your homepage. Let's do this on this blog. Step 3.) On the top bar, google will tell their latest crawl date of your website or blog. So that's it, this is pretty accurate and straight forward on knowing your last google crawl than any other third party services online.